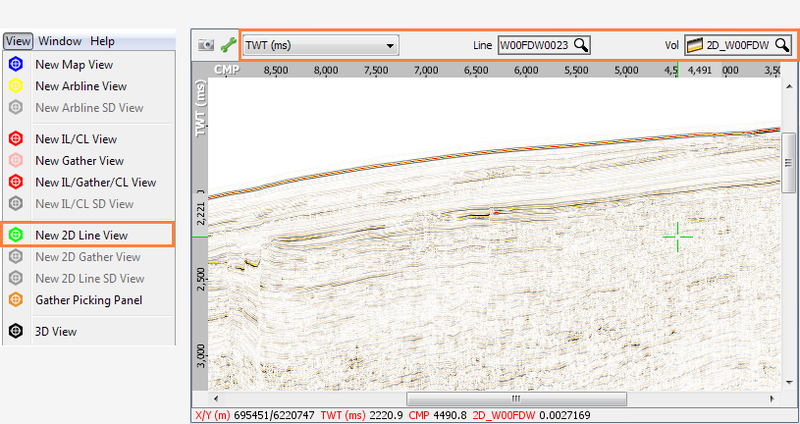 If you are working on a 2D dataset, you can view the data in the 2D Line View. 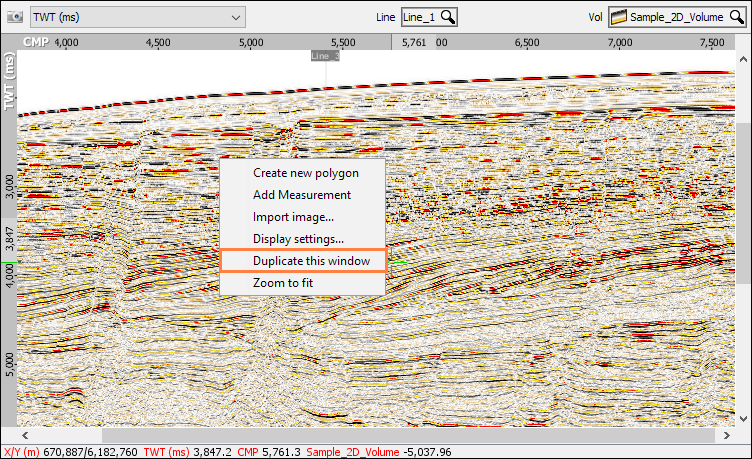 Multiple 2D Line Views can be opened to display and compare different lines or volumes (see Viewing Lines in Multiple 2D Line Views). From the View menu in the Control Panel, select 2D Line View. At the navigation bar of the view, select the parameter (TWT or TVDSS) to display. At Line, select the 2D line you want to view. At Vol, select the volume to view. From the Map View, right click on the line that you wish to view. Select Add new view for '2D line', and select 2D View. This will open a new 2D Line View with the Line and Vol already selected. From the Volume tab in the Control Panel, right click on the line in the Details Panel. From the Survey tab in the Control Panel, right click on the line in the Details Panel. Right click on any 2D Line View in Insight and select Duplicate this window. Insight will open another 2D Line View. By default all 2D line intersections are shown on the 2D Line View. These are turned on/off in the Display Settings. The thickness of the lines is also controlled here. Line labels can be turned on/off via the Show intersecting line labels option.